1995 Upper Deck Electric Court Gold Michael Jordan #339 PSA 10 GEM MINT WOW!! 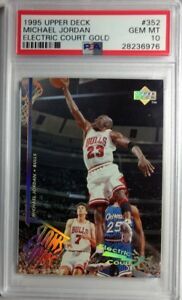 1995 Upper Deck Electric Court Michael Jordan #137, PSA Gem Mint 10, Pop 14 !$! 1995 UPPER DECK #339 MICHAEL JORDAN ELECTRIC COURT BRUTAL POP 7 PSA 10! Details about Rare! 1995 UPPER DECK #352 Michael Jordan, ELECTRIC COURT GOLD, POP 6 PSA 10!